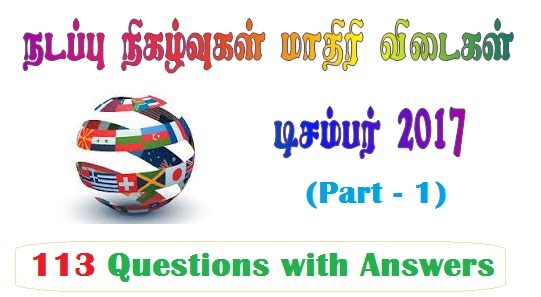 TNPSC Current Affairs Model Questions with Answers December 2017 (Part 1) Tamil PDF having 113 Model Questions with Answers. Overall Current Affairs Model Papers Part 30 in Format. Selected from TNPSCLINK Current Affairs Covers International Affairs, National Affairs, Sports Affairs and Environmental for Government Examinations like TNPSC, TNPSC Group 4 2017, TNPSC VAO, TET, TRB, TN Police and other Competitive Exams.